Hemming applies only when ordering. 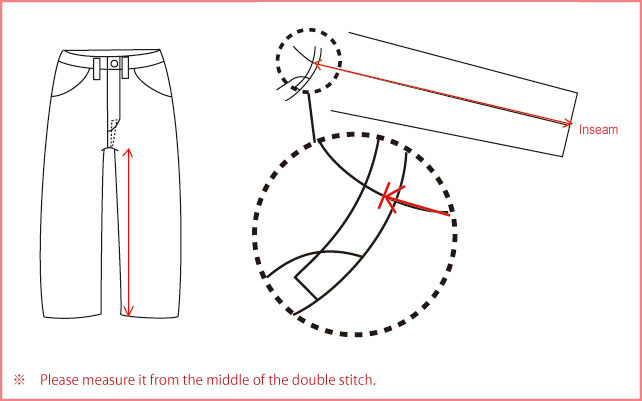 ※In the case of raw denim, we calculate shrinkage before take a hem up. Please make sure to wash a denim according to the guidance "LAUNDRY OF DENIM". If you wash it any other way, may cause errors in shrinkage. Right after you start to wear new pair of jeans, you might feel it’s length a little shorter than you would expected. That is because the wrinkle of the back of knee makes the length shorter. But after you wear repeatedly, it will settle down to the proper length. The measurement method is as follows. The Length differ according to conditions in the wrinkle of the cloth and how to measure. Please acknowledge the margin of error. Bilateral tolerance is about 1cm. ※When the hem up, the returns or exchange cannot be accepted.